12 April 2017: Exactly 100 years ago, was born Vinoo Mankad. He is undoubtedly amongst the greatest all-rounders of the game. People believe that Kapil Dev and Vinoo Mankad are the two greatest all-rounders from India. SAGE joins the many cricket lovers n paying a tribute to this maestro. 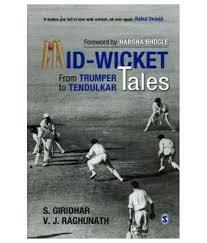 Revisit the lanes of cricketing history with authors S Giridhar and V J Raghunath, throughh their book " Mid-wicket Tales". Have never been ever interested in cricket as much, except for when there is a match between Pakistan and India. Although my whole family are great fans of cricket and watch almost all matches! !